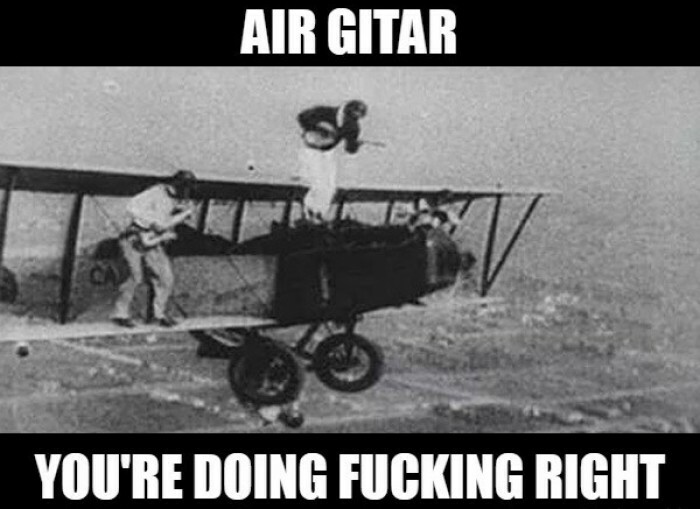 Air gitar, you're doing fu**ng right!!! Air gitar, you're doing fu**ng right!!! Guitarists playing guitar on a plane flying pretty high. That's why it's called air guitar :) Air guitar is a form of dance and movement in which the performer pretends to play an imaginary rock or heavy metal-style electric guitar, including riffs, solos, etc. Playing an air guitar usually consists of exaggerated strumming and picking motions and is often coupled with loud singing or lip-synching.